New York has been called a lot of things – rushed, brash, creative, and even rude. New Yorkers know that they are just going about their business, and yes, they admit to many of these labels. But weird? If you think that this description is going a bit too far, think again. A stroll around the streets of NYC revealed some of the craziest and weirdest structures you will ever see – anywhere. The building at 160 East 22nd Street near Third Avenue in Gramercy definitely makes the list of the most innovative – some would say craziest – in the city. This 24-hour concierge building is described as having a timeless exterior along with spacious interiors with features like attractive oak flooring and high end appliances. Add to that a fully-equipped fitness center and a lovely landscaped rooftop terrace. So far, so good, right? But as you gaze up at the structure, it may dawn on you that it actually looks like an oversized game of Tetris, and that’s just for starters. 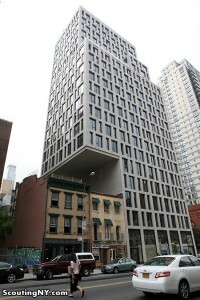 Even stranger is the fact that the building hovers above two smaller buildings with a large cantilevered section to the left, creating a sharp distinction between the lowrise past and the highrise future of Manhattan’s cityscape. But the design could have been crazier. Original plans called for the two smaller structures – which some believe contain a fortune teller and an empty space – to be totally incorporated into the larger building. 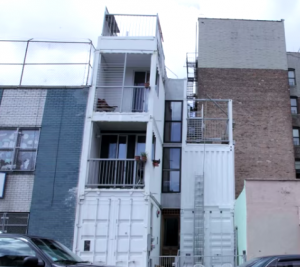 A Brooklyn couple thought outside the box and ended up living inside a series of boxes in a home they constructed entirely of shipping containers. It may sound weird, but think again. While the shipping container house at 351 Keap Street may be one of the craziest structures in the city, the architect and contractor duo did what they had to do to construct an affordable home in Williamsburg, a desirable area with escalating prices. The couple purchased six shipping containers at $1,500 apiece, created a design and went to work. They stacked the containers and connected them by a stairwell, resulting in a nearly 1,600-foot residence. It took just three hours to put up, cost $400K (including the $100K from zoning delays and excluding the land), and contains eco-friendly features like radiant heating from water circulating in the flooring. The innovative project has since attracted the attention of others, who are fascinated by the speed of construction, the modular aspect of the design, and, of course, the price. 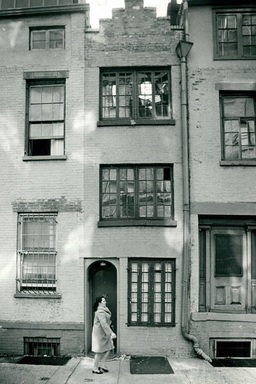 The narrowest house in the city at 75 ½ Bedford Street in the West Village remains on the radar for New Yorkers who love to keep track of its marketability as it is bought, sold and rented by residents and investors. City dwellers and tourists alike are intrigued by its storied history, crazy layout and rising prices. This unusual townhome, just 9.5 feet across at its widest and 2 feet across at its narrowest, is a skinny little house that comes with a multi-million dollar price tag. The cost reflects the unbeatable location, the inviting secret back garden and the legendary figures who are reputed to have called it home. After all, who wouldn’t want to walk in the footsteps of rumored residents poet Edna St. Vincent Millay, anthropologist Margaret Mead, actors John Barrymore and Cary Grant and others? More than a curiosity, “the half” has been totally renovated and now features custom kitchen cabinetry, built-in storage and oak flooring. Best of all, this crazy New York townhome comes with a side entrance, a handy exit to avoid all the tourists. Now we’re really talking crazy! The 1847 Greek Revival townhome at 58 Joralemon Street in Brooklyn Heights looks pretty much like all the other row houses on the block, but don’t expect to meet the neighbors. 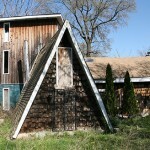 This innocuous looking structure is really – are you ready? – a ventilator and emergency exit for the IRT Lexington Avenue/Eastern Parkway line of the city’s subway system. Through agreements with the Landmarks Preservation Commission, the New York City Transit Authority allows the exterior façade to remain as is to blend with similar structures in the neighborhood. Pay no attention to the blackened out windows that community residents sometimes adorn with flower boxes. 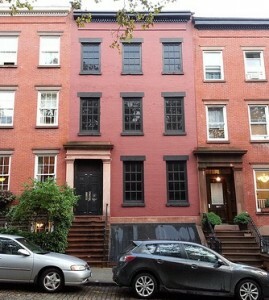 Generally speaking, in true form New Yorkers living in the area understand the building for what it is and accept their eccentric neighbor, which was valued at $2.8 million in 2010. Call it an architectural leftover, an anomaly or frankly unbelievable as some describe 15 East 47th Street. This six-story office building is just plain weird, and ugly, too. The building stands in stark contrast to its neighbor at 17 East 47th, the former Mercantile Library and possible future Merc boutique hotel which will use air rights to build upward while preserving the intricate existing façade. The crazy 15 East 47th building next door is totally veiled by an overlay of metal interconnecting rings. This strange obscuring wall starts above a doorway designed with three large circles and stretches all the way up to the roofline, and it is estimated that more than 6,000 brass rings were used to construct the wall. 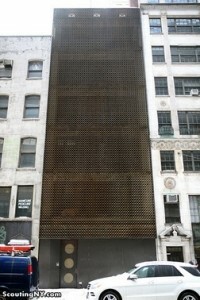 The building was obtained by the Algerian government in the 1970’s and used as their mission to the United States. People working in the area have reported caretakers living in the building. Some believe that the ringed wall is an interpretation of the Arabic mashrabiya, which provides privacy while encouraging the circulation of fresh air. But if you want to see the building you will have to be satisfied with photos. In the fall of 2014, a scaffold went up and the rings came down. Revaluate hosts the best No Fee NYC Rental Map and displays a Carfax like home history report for every Manhattan address.